A group of 25 men came together Aug. 4, at Vancouver Avenue First Baptist Church, to bridge the gulf between church and street. Convened by Royal Harris of The Aristotle Project, who works with gang-affiliated men, the networking brunch included church leaders and men who grew up in street gangs. Some of the men had known each other for decades; others were meeting for the first time. Men who once were enemies from rival gangs declared their friendship and commitment to helping young men stay alive and out of prison. The conversation looked at the reasons for mistrust between church and street leaders, as well as ways to collaborate and support one another. Everyone agreed on the value and importance of religion. Almost all the men professed a strong belief in, and reliance on, Christian spiritual beliefs. "I was at my cousin's funeral last week," said Elder Elmer Yarborough, a youth worker. "He was murdered. I'm tired of going through it. I'm tired of young people dying." Everyone in the room seemed to understand that feeling. Many had lost friends or relatives to violence. Marcus Miller, DeAndre Clark and Yashanee Vaughn were just three mentioned by name. Other men present had been shot, stabbed or incarcerated as perpetrators. So each man brought an insider's perspective to the discussion on how to work across the divide between church and street. Black men have a crucial role in raising children and guiding young men, said Harris. "The reality is that the two most influential groups of Black men in Portland are pastors and gang members. We have a situation where, as men, we are caught up in those labels. "The streets helped raise us, but everyone here grew up in the church. We need to help the streets get involved with Sunday, and Sunday get involved in the streets." The men discussed the challenges facing Black boys and men. Finding a way to make a few dollars, for example, is crucial for young men whose families are struggling financially. "These kids are not at risk because they are foolish," said Pastor Dwight Minnieweather. "They're at risk because someone put them at risk." One man who is currently on parole said he came to the group because he knows other Black men can truly understand his struggle. He pointed out that despite his own run-ins with the law, he has helped his own son make safer choices. "My son is 21 years old and he is not involved in gangs," he said. The men noted the impact on families of incarcerating fathers. "It's 2 a.m. and you're 15 and you're still outside," said Spank. "A lot of these young men are looking for men to raise them." Harris said that in his experience, each generation of boys looks to the generation just ahead of them. "The best way to guide 13-19 is to let them talk to 20-25," he said. "And the best way to guide 20-25 is to let them talk to 25-30." Choo, employed as a mentor for young men leaving prison, said he welcomed the recent attempts by church members to reach out to young people. But focusing on the youngest age groups without also reaching out to the other men in the neighborhood, is not an effective intervention. When church groups leave, the youth will still be looking to older gang members for role models, he said. "Don't pass the OGs up to go talk to the young ones." Val Polk, who works with gang-affected youth, said his team has taken five guns from teens and broken up countless fights. What's frustrating, he said, is for church members to be present, but not helpful. "I was breaking up a fight between a mom and her son," he said. "And you just stood there watching me. It's hard for me to accept what you're doing when I'm looking at what you're not doing." Harris said violence prevention takes youth workers into dangerous situations where they are literally putting their lives on the line. When support is needed they turn to one another for backup. When trouble is underway, "I'm going to come and get Spank," Harris said. "We might both get shot… But we're brothers on the street, and that's love." The perception is that the pastors are not taking those same risks, he said. Pastors and church members are only human, so like everyone else they have shortcomings, said Pastor Mark Strong to agreement. Churches will never be perfect places; they are what we make them. Strong said some criticisms come from misperceptions. For example, Eleven:45 is not receiving any money to work on youth violence prevention, despite rumors to the contrary. And pastors are dealing with a lot of different demands –from comforting bereaved families to organizing help for seniors. "Everything you do, you don't put it on blast," he said. "Most pastors I know, they go weeks without a paycheck. Yes, there are areas where the church needs to be and do better. Church is not a perfect place. The church is about people that are in process. "It's the kids, yes. But it's also the other parts of the community." Pastor Matt Hennessee said he appreciated the group's honesty. "It says to me I have to do a better job," he said. "When I walk in the park, if something happens, I have got my brother's back, because that's just what I do. I don't need to run for safety." Pastor George Merriweather said pastors are working on many fronts to support their church communities. He pointed to the family connections that join church members to gang members, including in his own family. "I don't live in a church. I pastor a church, but I don't live in a church," he said. "I'm passionate about what's happening. I care about what's going on in this community." Merriweather said the responsibility to reach out goes both ways. "You're the brothers we need," he said. "Why don't the OGs come and talk to us?" Two men talked about being turned away from a church because of the clothes they were wearing. Polk said he was raised in the Southern church and missed its familiar atmosphere. He had tried several churches in Portland, but had yet to find a church where he felt at home. Rob Richardson, a longtime prison visitor and prisoner advocate, said too many Black children are being raised through institutions because of family breakdown, and the incarceration of Black men. Relationships built on caring, and understanding one another at the heart level, are what help young men become successful adults. "If you can keep them breathing, then they can be a pastor, or get that degree," he said. Much more important than giving young men a few dollars, is to show them you care by spending time with them. "Because they will remember that fishing trip," he said. 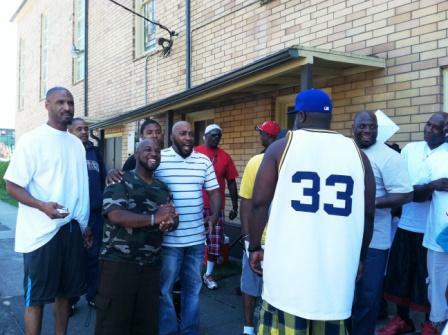 "You spell love T I M E."
The men's group plans to meet on a regular basis.